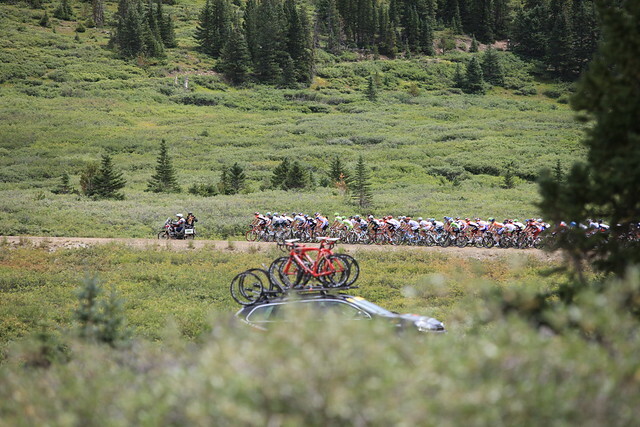 On the Thursday before the USA Pro Cycling Challenge I was called into one of my coworkers office’s. 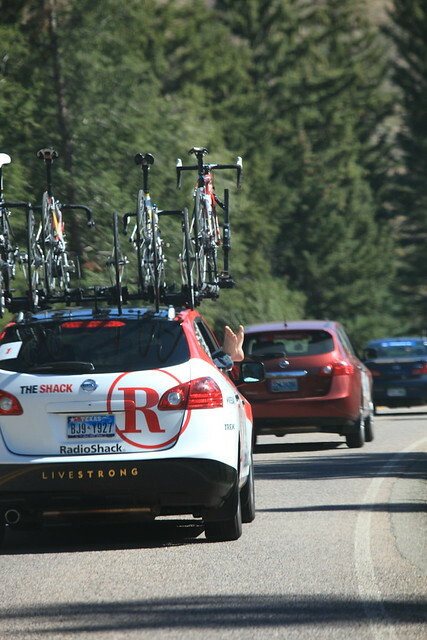 He said to me that he was offered a chance to ride along with the Garmin team in their follow car during Stage 2 of the race. I was pretty psyched for him, I mean, not everyone has that opportunity! So when he said he wanted me to go in his place, that was even cooler! The idea was that with all the cameras and whatnot I may actually be able to bring something back that the company could use rather than just go and smile pretty the whole time. It was a bit of a blessing and a curse at the same time since I was in the process of organizing a ride with Team Rwanda Cycling as well. This was another last minute thing and I really wanted it to be successful so shooting to the other side of the state sounded like it may not be the best plan… Oh well, once in a lifetime right?! 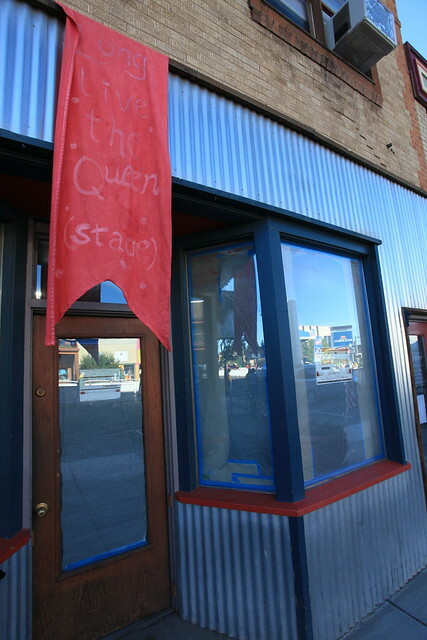 So I hopped in the car and headed to Gunnison, the start of Stage 2. 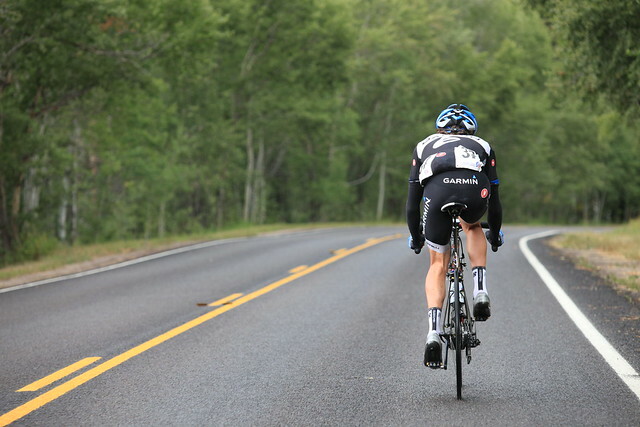 I got in around 9 and hit the sack ready for a good day following the tour on the most epic stage of the race. In the morning I got up ready to go and headed over to the venue. It was about a mile walk from my hotel and I thought: “well, I am going to be in a car all day, lets stretch this out.” So I took my time and walked all over the town. 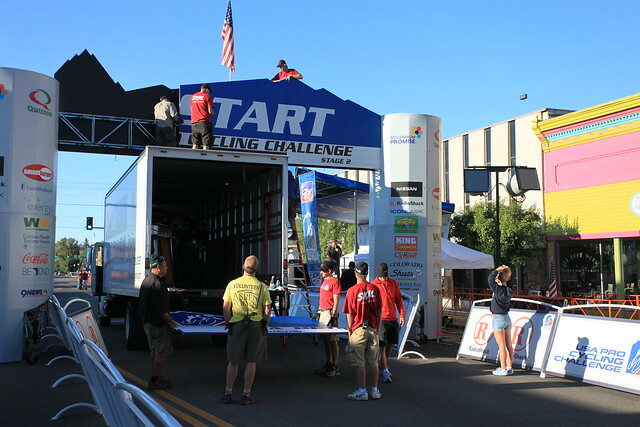 The town was prepped and ready and the race was in setup mode. It was a cool feeling with all the energy in the air. 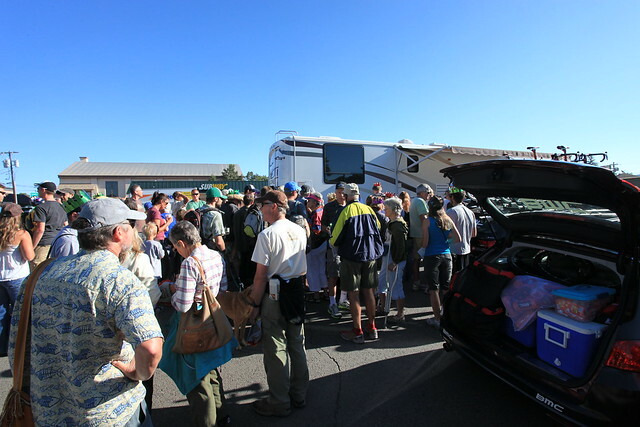 When the teams started arriving everyone flocked to the staging area and started looking for their favorite riders. After a bit the Garmin fleet arrived and I headed over to meet up with my driver for the day. I stopped over and checked in then was introduced to my driver, Robbie and of course they introduced me to JV. I’ve never been an autograph guy, but it is interested to see these guys in action. In the same breath of making decisions pertaining to todays events JV was signing shirts, hats and other things. If you were there for an instant you may think he was being short with someone, but in reality he was making time for each person that came up to him while still trying to make all the decisions that need to be made before the stage. 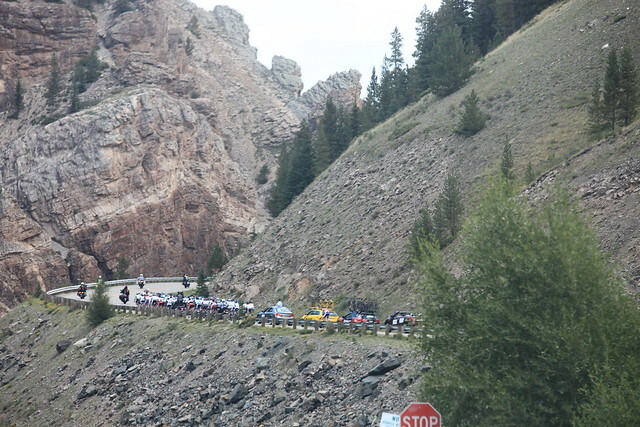 Then we would have glimpses of action, typically on big sweeping corners but then also over the passes, the KOM’s and wow, there were some crowds. 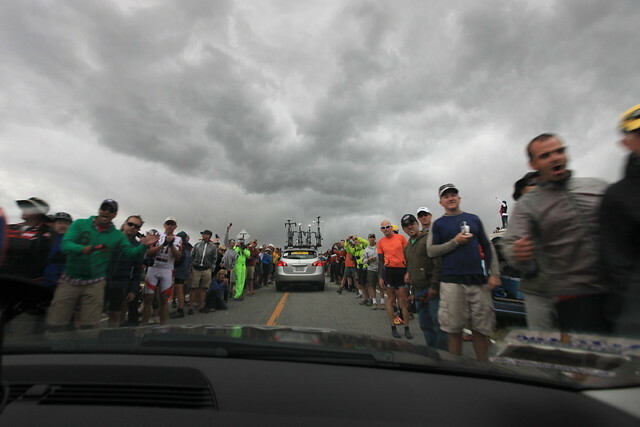 When we crossed over the top of Independence pass the crowds were incredible. I mean, you have seen it on TV, but when it is around you it is a whole other experience! I know that the crowds have been known to get unruly, but it sure is energizing! The day was incredible and arriving upon arriving in Aspen it was nice to step out of the car and walk around! 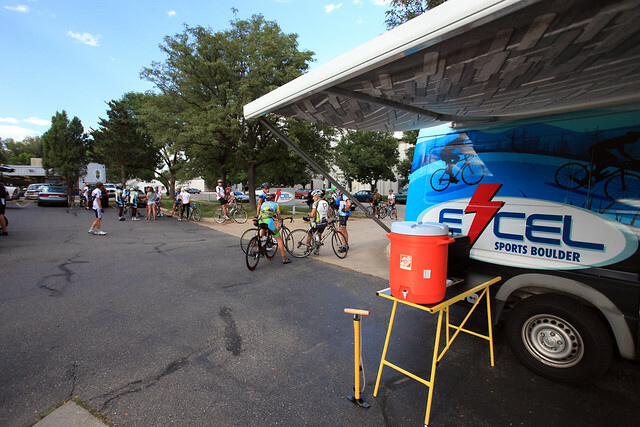 The following Tuesday (aug 30) was a ride we (excel sports boulder) organized with Team Rwanda Cycling. 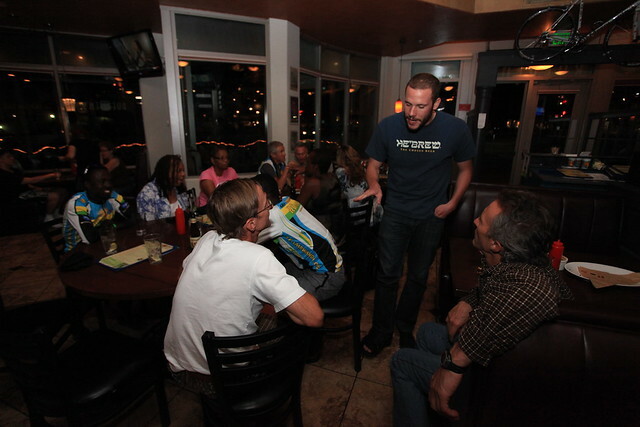 Jock Boyer is a longtime friend of the owner of Excel and his quest to create a team and a healing organization for Rwanda has brought him with some of the team members to the states. 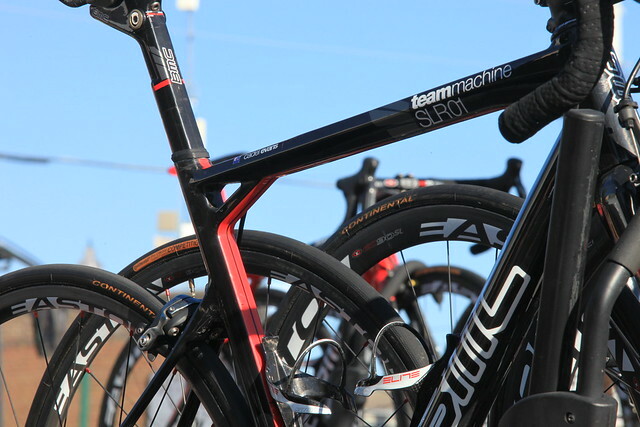 We put together a ride with the team and a dinner at a local restaurant to help them raise money for the organization. The turnout for the event was great. We had at least 45 people show up at the shop to head out on the ride and a few more that met up along the way. 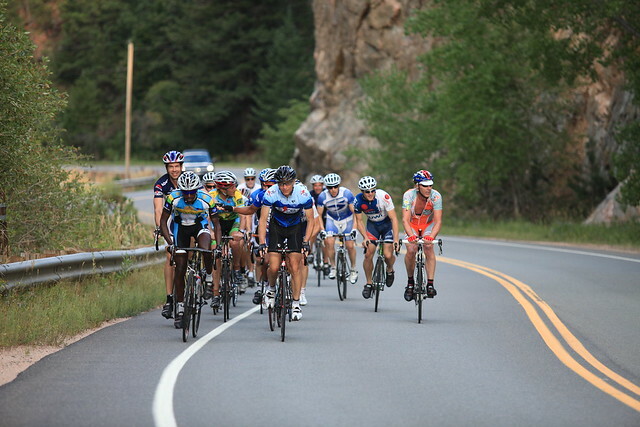 The ride that was planned was fairly common in Boulder. Lefthand Canyon is a nice gradual and consistant climb so you don’t run into too many really steep portions. Jock took the time to chat with people on the ride as well as at Reubens later. It seemed that everyone had a nice time though the ride may have gotten off to a faster start than some would have liked. Afterward we all headed to Ruebens. 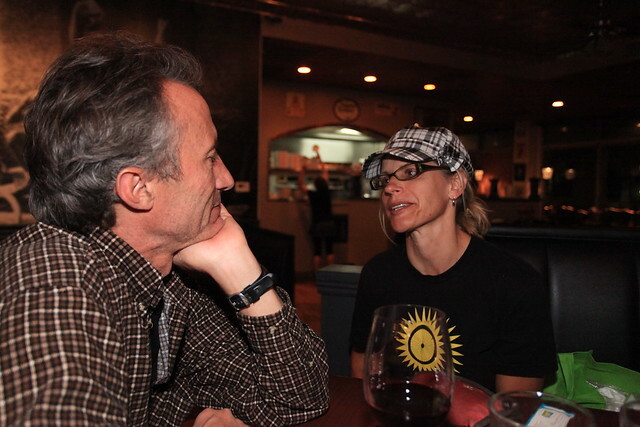 Ruebens is a reasonably new place in Boulder, but Rueben is a cycling enthusiast, He loves it. He encourages cycling to come to his place and when you go in there, if you look closely, you will probably see some faces that you recognize. We arrived with 35-40 people and Rueben was ready. We sat down and had a great dinner and in the end $3 from every persons bill was put toward the Rwandan team. Other donations were made as well and though I don’t have a tally of the donations I have my fingers crossed that it was successful for them as well. The evening was a success and we were glad to be able to participate. 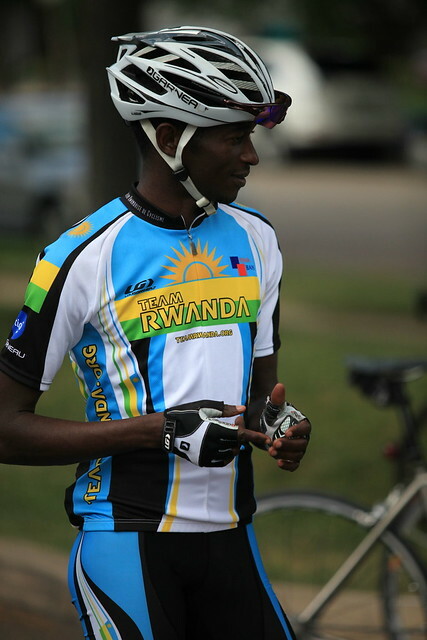 If you have a chance check out Team Rwanda Cycling, they are a great group and good fun to meet and hang out with. 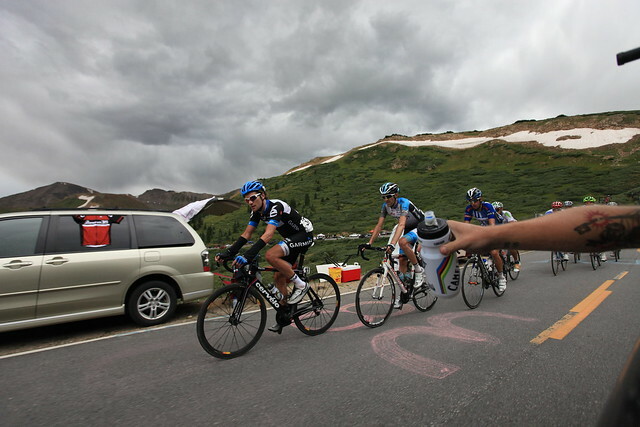 Also keep your eyes peeled for Rising from the Ashes, a documentary on Team Rwanda Cycling.